This part was never submitted due to time constraints, but is characterized. Olfr1258, olfactory receptor 1258, is a native GPCR in Mus musculus and recognizes 2-butanone. 2-Butanone is a Volatile organic compound (VOC) which means that it acts as gas in room temperature . Through incorporating the GPCR, Olfr1258, into yeast, the yeast will be able to sense 2-butanone, instead of their own mating pheromones. When the butanone is sensed, the GPCR will be activated and mating between two yeast strain (a and 𝞪) will occur . Check out Project description for the GPCR usage in our project. To replace the native GPCR and incorporate the new GPCR, Olfr1258, a CRISPR Cas9 technique was used with the gRNA presented in BBa_K2329002 page. The incorporation showed to be successful according to colony-PCR. To enable visualization of the localization of the receptor in the yeast cells, the GPCR transformed was fused to a GFP tag. The green fluorescence could then easily enable detection of the GPCR. For the yeast with Olfr1258, the membrane localization of the GPCR could be verified. In Figure 1a, it can be seen that Olfr1258 is clearly located in the outer membrane of the cell. In Figure 1b, it can be seen that these cells fluoresce in the nuclear membrane which is clearly shown when the cells in this image is dividing. This image thereby suggest that the GPCR is localized in all membranes. Figure 1. The yeast expressing Olfr1258 fused together with GFP. The image visualizes the membrane-localization of Olfr1258 due to the green fluorescence expressed at the edges of the yeast cells. To evaluate if Olfr1258 is sensing 2-butanone, a growth test with different concentrations were performed in a BioLector. A plasmid with the promoter FUS1 upstream of GFP was transformed into the yeast strain with Olfr1258. The activation of PFUS1 occurs when the GPCRs get activated, and therefore begins expression of GFP. The results shows that an increased concentration of 2-butanone gives a higher output of GFP expression, visible in Figure 2. 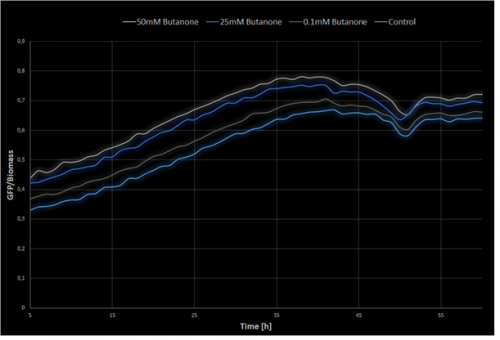 This shows that the sensibility of 2-butanone works successfully in yeast with the GPCR Olfr1258. Figure 2: A plot over GFP/biomass against time, for three different butanone concentration and one control. The conclusion that could be drawn is that Olfr1258 seems to be membrane located, as the literature predicted a GPCR should be. We can also say that the GFP expression is higher with a increase in 2-butanone concentration, and by that the activation of PFUS1 is expressed in a higher rate as well. PFUS1 is dependent on the expression of the GPCR, which mean that Olfr1258 can sense 2-butanone. Check out Team: Chalmers-Gothenburg Achievements: Project results for more information. Suzuki Y and Shimono K. Deciphering the receptor repertoire encoding specific odorants by time-lapse single-cell array cytometry. Scientific Reports, 6(19934):1-9, 2015. Merlini L, Dudin O and Martin S. G. Mate and fuse: how yeast cells. Open Biology, 3(3):1-13, 2013.